The five big ponds offer a beautiful prospect on diverse sea beds. The public lives different sensory experiences at each pond: for example the fascinating and impressive sensation to be able to evolve in the middle of the sharks or the delight of being surrounded by the lively colors of tropical fish. The meeting room is a place to share knowledge through the broadcasting of movies, discussions... Finally, the temporary exhibition allows interactions of artistic practices like photography or painting. Punctuating the visit, interactive exhibitions and digital information are given to all. The Aquarium is one of the main public buildings of the city offering outdoor areas open to the public. The green walk is continued along the waterfront and a removable bridge is installed. The local barges are rehabilitated in marine research centers. The building works differently following flood levels. 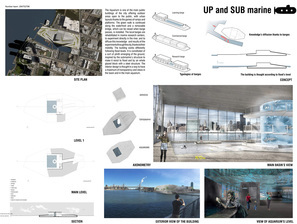 It is constituted of a sort of plinth emerging of the ground, inspired by the submarine’s structure to make it resist to flood and by a glazed block. The interior design is thought in a way to have a maximum of views in the basin and in the main aquarium. the public space outside and provides apart from the service spaces a restaurant and a square with a shelter. The four aquariums are divided all over the building and each of them has an own interesting identity. We designed one aquarium underground, an aquarium around an elevator, one that can be seen from below and one aquarium where visitors can go through. 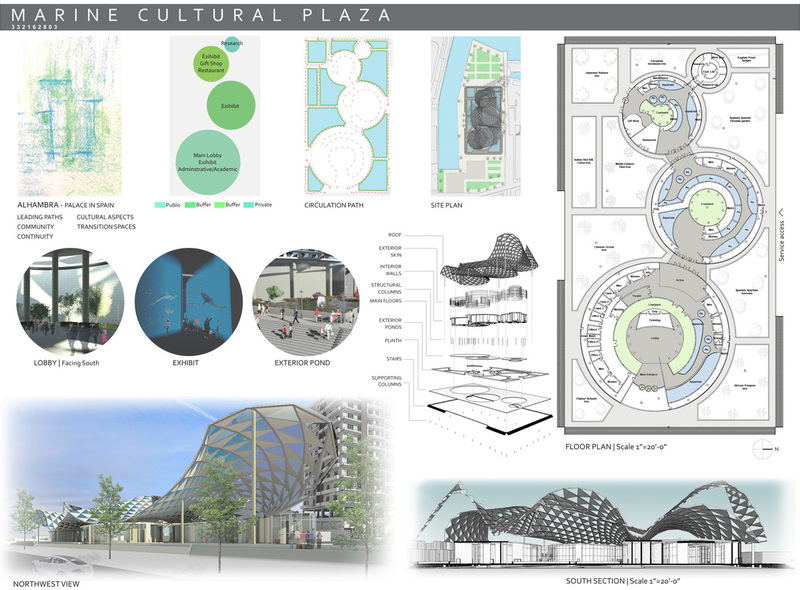 The Marine Cultural Plaza’s concept is based on Alhambra palace. 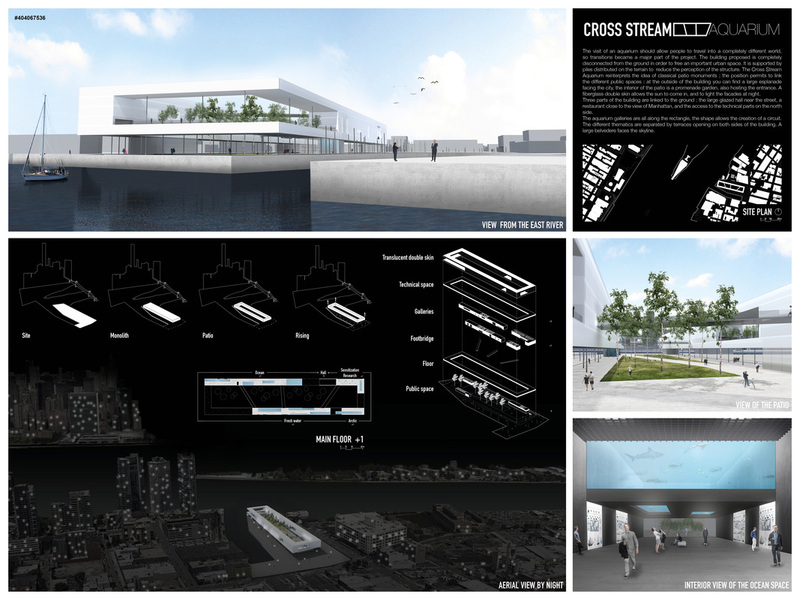 The concept is composed of four main spaces, a small courtyard in each as an experience while walking through. 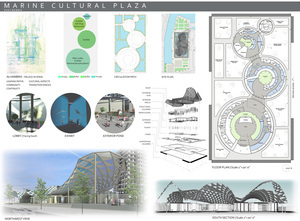 Surrounding circles by water ponds and gardens to understand leading paths, community, and transition spaces. To understand cultural aspects, each pond represents a culture with trees that relate to each culture. 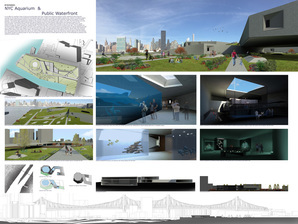 A curved wavy-shape roof made of steel and glass to reflect water. The flat floor with supportive columns holds the building 6’ 6” above ground to create view of Manhattan’s skyline. Underneath space are for mechanical, ventilation, and flooding protection. 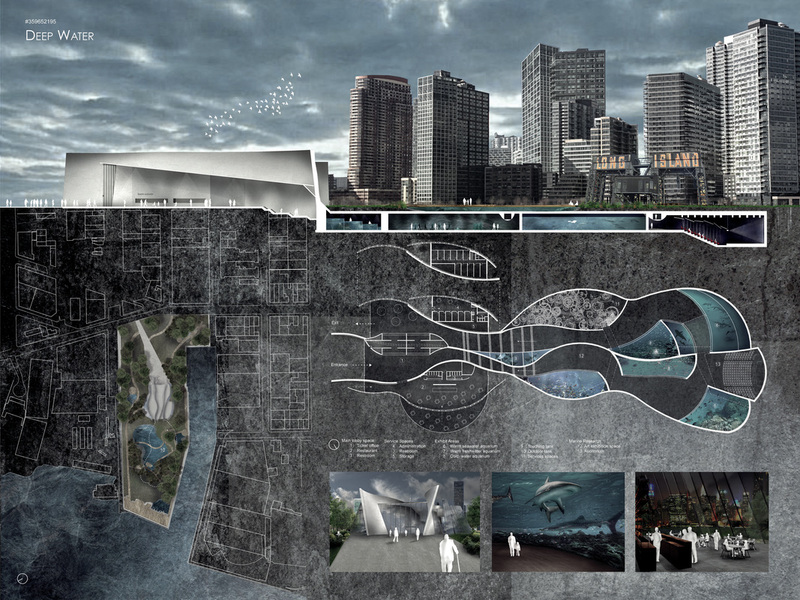 Proposed design reverses typical aquarium/museum building’s inwardness by scatter its content out in the open. Result is a sculptural park with series of free open exhibition space and water-themed recreational activities. 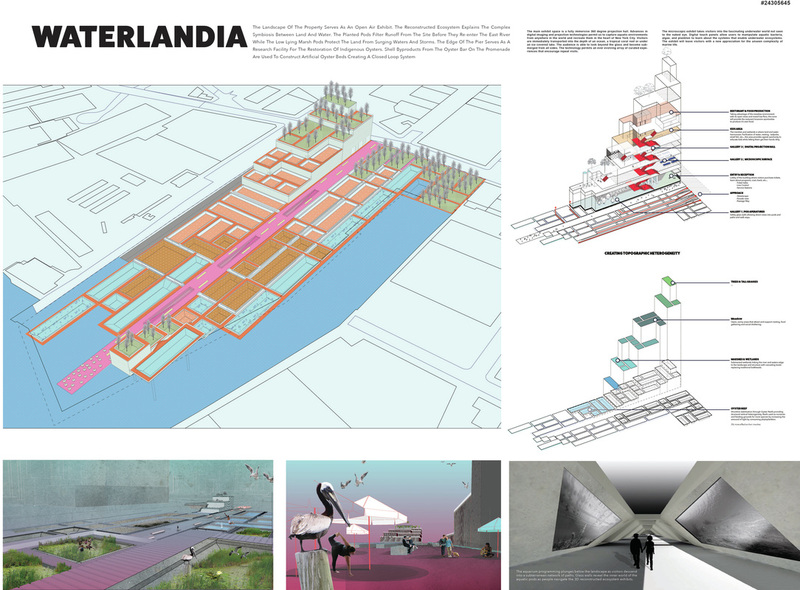 Existing site’s spatial form and scale is preserved with arrangement of installations and retained structures. 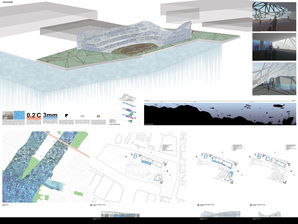 With ability to clean the river’s water and act as temporary reservoir to ease flooding, this ex-industrial site is transformed to an urban ecological machine. NYC AQUA PARK is a new hybrid of public cultural space which celebrates marine life, local history, and East River. Sea level rise represents a direct consequence of global warming, exposing coastal areas to significant risks of flooding, including the site. 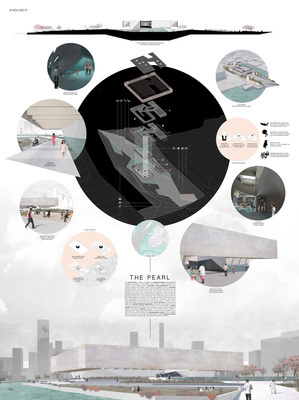 In response to this event, the site assumes the role of protector of the precious object by a layered resilience topography like the oyster defends its pearl from surrounding obstacles. 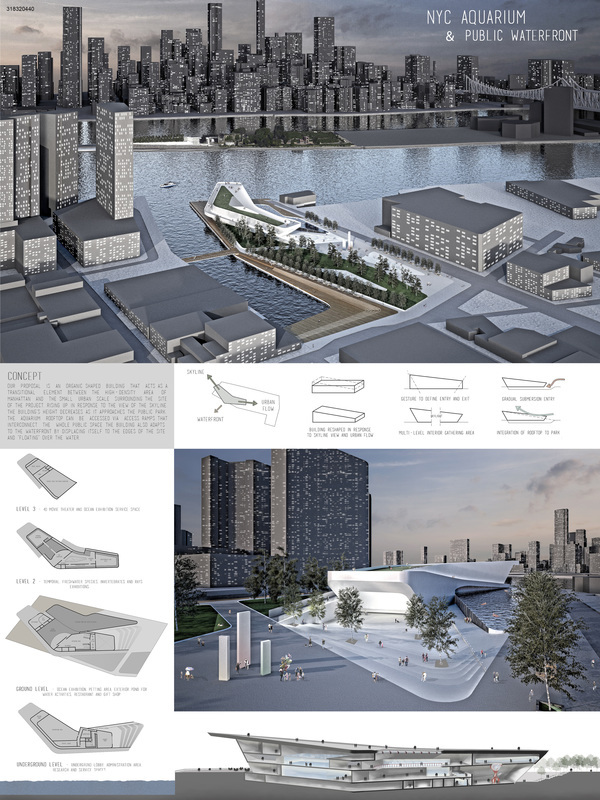 The raised up site offers a gradual relation with the river bank and the street by passing through the aquarium that gives a floating impression. On a smaller scale, the project is fragmented into several functional spaces to liven the place and enhance the interdependent nature of the ensemble. 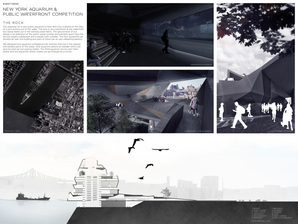 sThe project aims to explore how aquarium in multiple types can integrate with public rooftop park that stimulates the interaction between human and non-human in urban context. 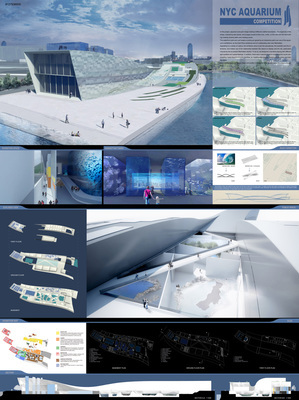 An aquarium for the 21st century should not only be capable of exhibiting animals but also responsible for educating the future generation through the design and spatial form. 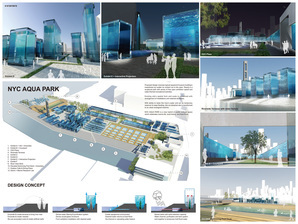 The Aqua-Park concept creates a sequence of interior and exterior spaces that can accommodate species which requires different temperature and light conditions. It also offers great flexibility of shifting programs and spatial arrangement in order to hold special events. Bridge near the site. Passing under this wave grants visitors access to the public waterfront park. 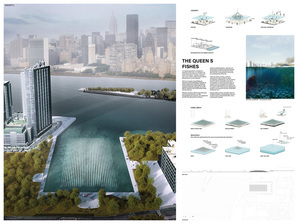 Entering the aquarium, visitors will get to experience the large variety of fascinating aquatic life found in the East River, New York Harbor and North Atlantic Ocean. The project is organized around a central volume, which represents the fulcrum. On the ground floor of this volume, you can find all the aquarium services and the exhibitions access. Visiting the aquarium can be made in one entire tour allowing the visitor to attend the entire aquarium, or visiting just one section avoiding the rest. Technical spaces have been set in the volume underneath the show tanks, where there are spaces for marine research. The central section contains a shop gallery which it is possible to get in from outside. On the last floor there are the management offices. 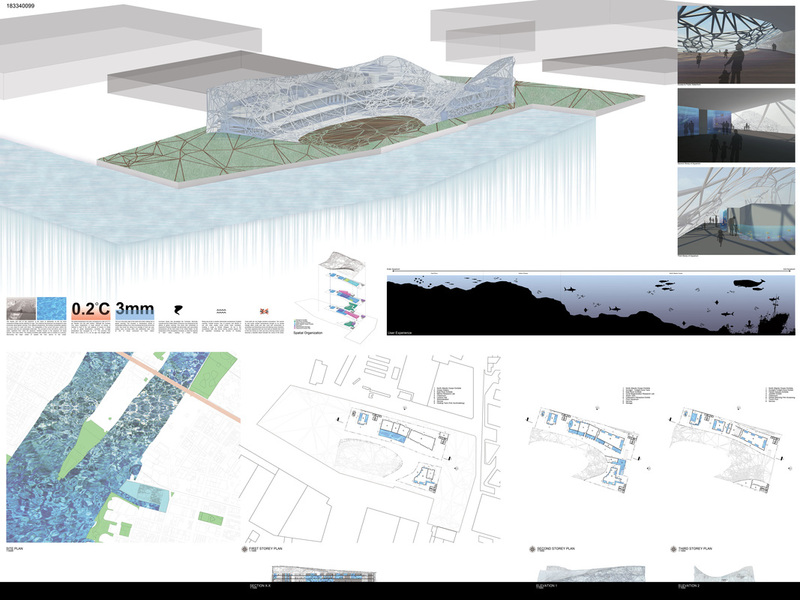 AQUASCAPE was designed to reverse the role of humans and marine life, challenging who’s looking at whom in the aquarium typology. 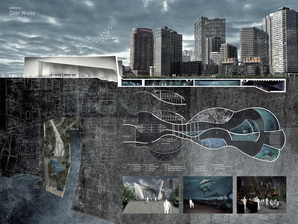 Through a continuous form and circulation flow derived from existing site conditions, visitors descend through the levels of the Atlantic Ocean, viewing marine life in their natural habitat, rather than separate unrelated exhibits. 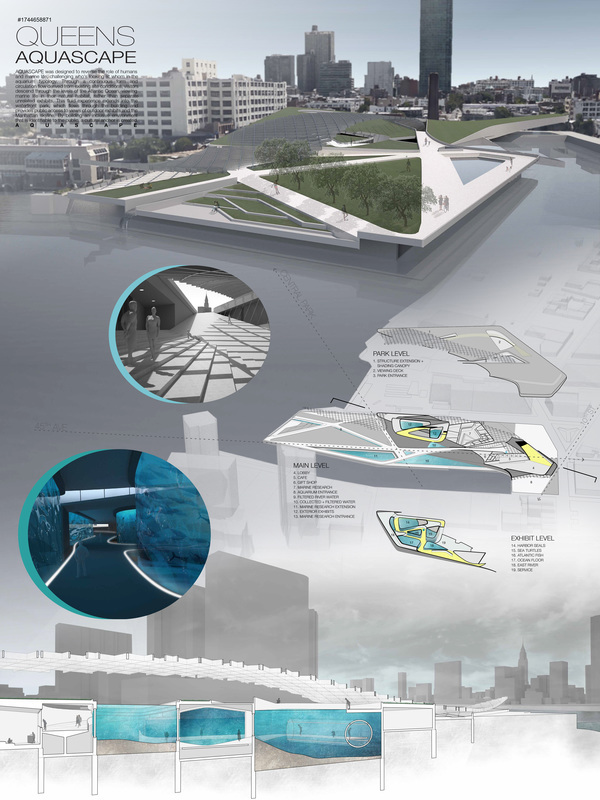 This fluid experience extends into the waterfront park, which flows through the building and provides public access to views of outdoor exhibits and the Manhattan skyline. By building an inclusive environment that is identifiable to the public, a cultural anchor is created. 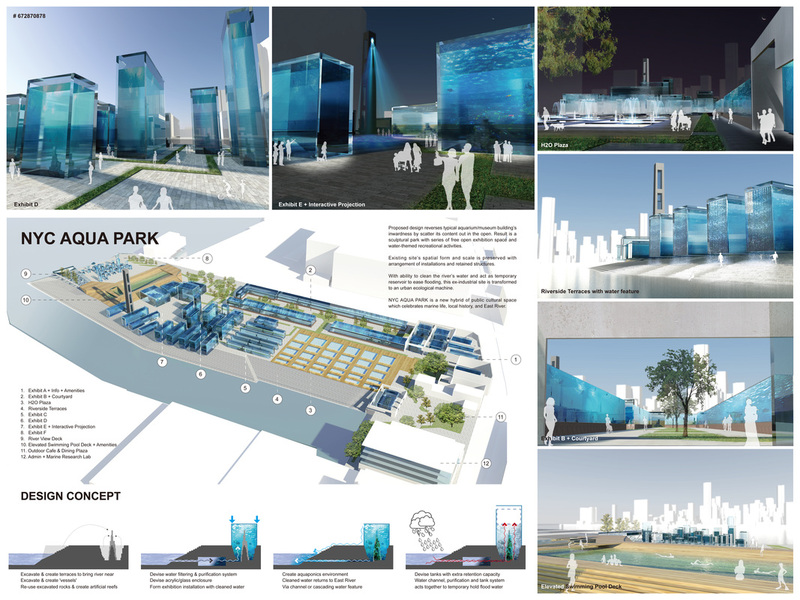 Much like the way oysters filter contaminated water; our site will gradually filter out the urban environment as well as treat surface water on-site. As people traverse through our oyster-shaped aquarium, as sand would do in our oceans and lakes, they would “solidify” their knowledge of marine life and experience it through alternative perspectives. The primary goal of our aquarium is to focus on the education and preservation of our sensitive aquatic ecosystem, and to secure its longevity for future generations. The building proposed is completely disconnected from the ground in order to free an important urban space. 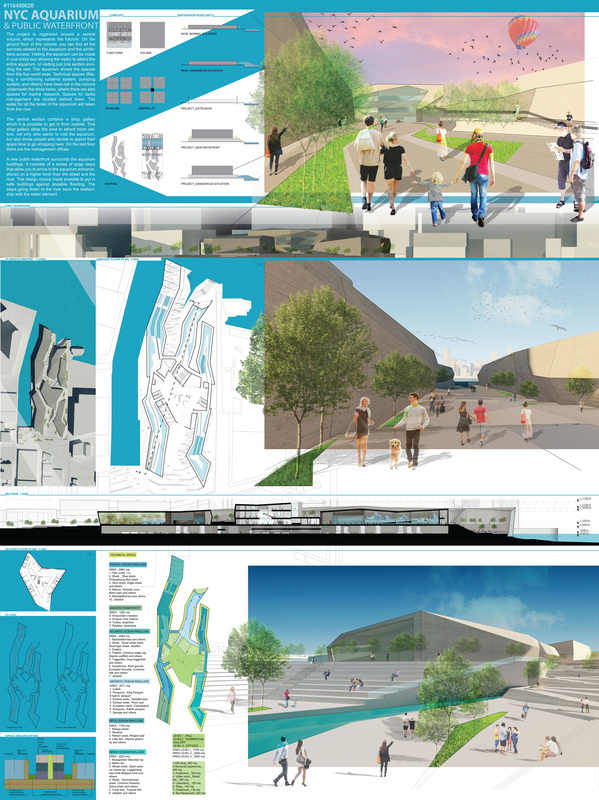 It is supported by piles distributed on the terrain, reducing the perception of the structure. 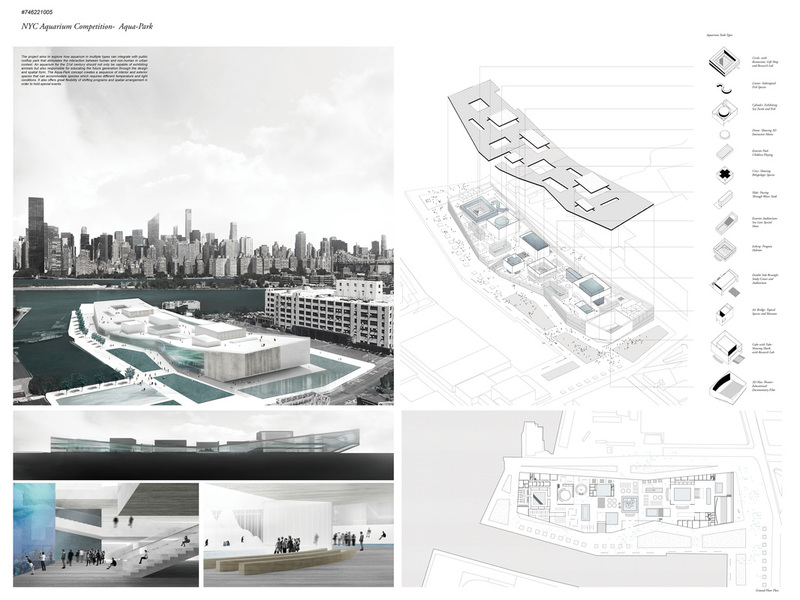 The aquarium reinterprets the idea of classical patio monuments ; the interior of the patio is linked to the street : the exterior is an esplanade, the interior is a promenade hosting the entrance of the building. The aquarium galleries are all along the rectangle, the shape allows the creation of a circuit. The thematics are separated by terraces and a large belvedere faces the skyline. 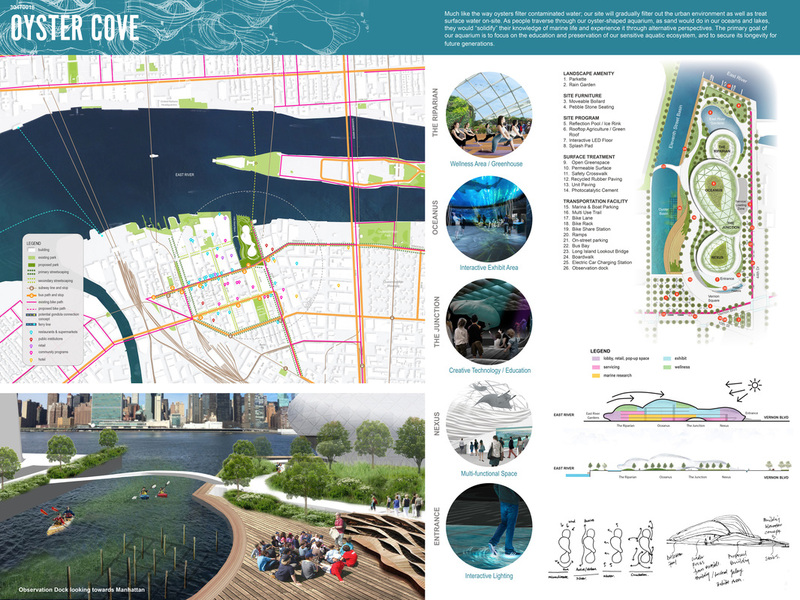 PERFORATE is conceived as a marine wetland habitat that follows NYC’s wetland restoration strategy as a storm mitigation/habitat creation solution. 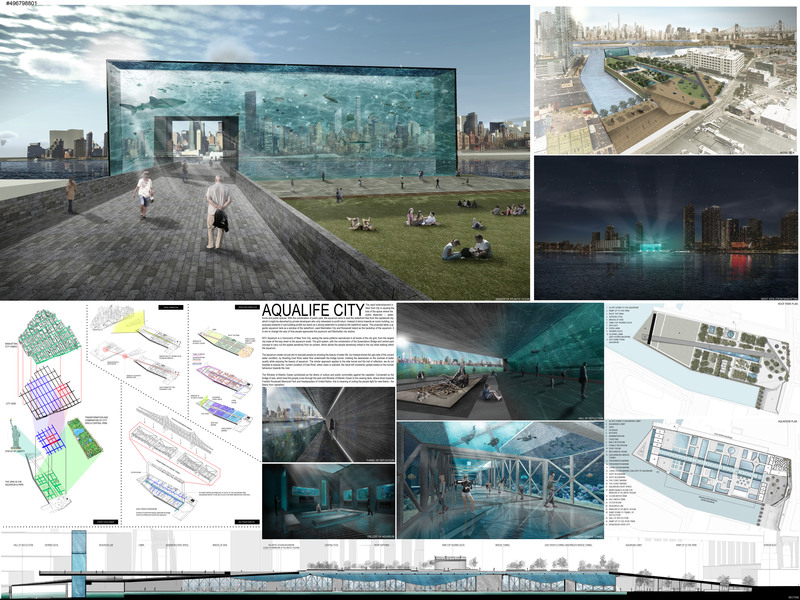 The aquarium wing of the park offers up a nontraditional aquarium experience by allowing the community to peer into the underwater nature of NYC’s vibrant waterways. 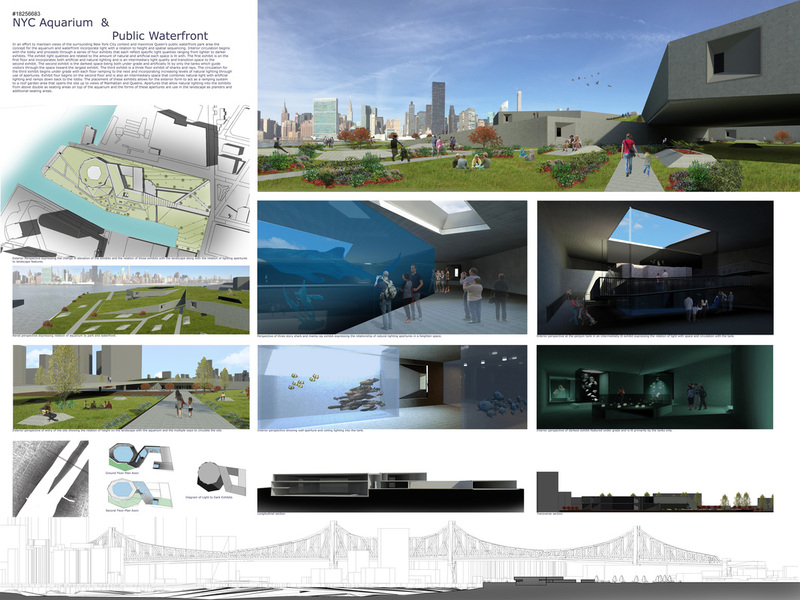 The wetland creates an ideal habitat to attract aquatic species, playing off the “pseudo-ecologies” of nature/city. By infiltrating the site with water and creating a network of perforated boardwalks, the public waterfront component permeates the entirety of the site. 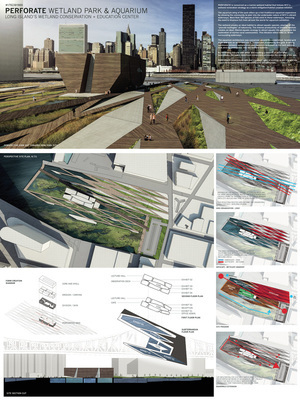 This expanded wetland habitat creates a filtering effect on the surrounding waterways.